Part of the Arecaceae (Palm) family, members of the Butia genus are called "feather" palms and consist of 22 species. Butia capitata is the most cold-hardy. Mature Size: 15-20' high and 10-15' wide. Flowers: Pale yellow to reddish, with 3 petals and 3 sepals, on many strands connected to a central stalk. This inflorescence is enclosed in a woody spathe which splits apart when the flowers are ready to open. Separate male and female flowers are grouped in threes - two male flowers and one female. Male flowers have 6 stamens. Fruit: Yellow-orange, round to oval, 1" diameter, with a single round seed and fibrous flesh, hanging in large sprays. It has a sweet-tart, mixed-fruit taste which has been compared to apricot, pineapple and banana, or mango and peach. Its quality varies from plant to plant. Months for fruit to ripen: 3-4. The fruit is ripe when fully colored, sometimes with a slight blush. 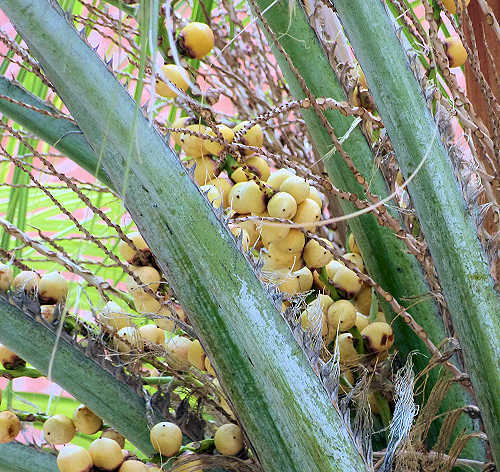 One palm may produce 50-100 pounds of fruit. Storage after harvest: Refrigerate up to one week. Leaves: Blue-green, long, and arching. The v-shaped central stalk has long, narrow leaflets growing along both edges. Stems: Trunk is 1' - 2' in diameter. Leaf stems have thorns. Roots: Not invasive. Susceptible to root rot in moist soil. Wildlife: Flowers attract pollinating insects, fruit attracts mammals. Toxic / Danger: Thorny leaf stems. Origin: Central-southern Brazil and adjacent areas of Uruguay and Argentina. USDA hardiness zones: 8b-11. Hardy to 15°F when young, possibly 5-10°F when mature. Water after becoming established: Deep water monthly. Additional water speeds growth. Soil: Very well drained, tolerant of soil types otherwise, pH 6.1-7.8 (slightly acidic to slightly alkaline). Salt tolerant. Fertilize: Fertilization speeds growth but it is mainly used in case of nutrient deficiency which is likely in alkaline soil. Use an organic fertilizer and a citrus micronutrient solution containing magnesium (Mg), manganese (Mn) and iron (Fe). Apply mid-spring after one year in the ground. Do not over-fertilize. Apply under the canopy but away from the trunk. Mulch: No. The soil must dry quickly. Spacing: Best with 100-200 square feet for adequate root spread; 10-14 feet between it and the trunk of another palm or tree. Prune: Remove lower leaves when they become untidy. Propagation: Butia species have a reputation of being difficult to germinate. One method is to take soaked seed, bury it in moist vermiculite and perlite in a closed container, and cycle it between 70-105°F over a 24-hour period for one month or until germination has occurred. An alternate method is to take the seed, newly cut from its fruit, and gently crack and remove the outer husk, then provide the same container treatment. Uses: Ornamental palm. The edible fruit naturally contains pectin for jelly. The seeds have been roasted and ground as a coffee substitute. Former scientific name: Butia odorata. Another common name is Pindo Palm. Jelly Palms are very wind tolerant. 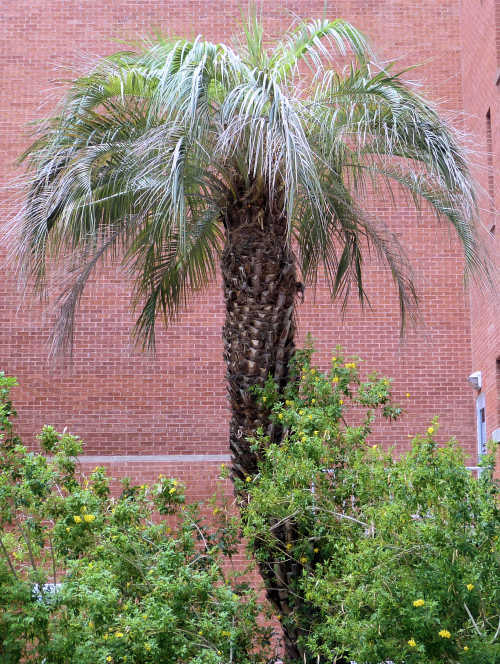 Several other palm species closely resemble the Jelly Palm and its variability in appearance could be because it is mistaken for those other palms, or possibly because of hybridizing with other species.